How did it get to be so long since my last entry? What with the Beamish Boy going off to see his mates from Uni, and my laptop dying, I was aware that it had been a while - but I really didn't think it had been 5 weeks. I've been thinking a lot about the role of the designer in knitting patterns recently. There have been a couple of conversations on knitting lists which have sparked this off. In one, I was told that I wasn't a professional designer. After I had explained, very clearly and in words of one syllable, just why I am a professional designer, I came to understand that what she meant by 'professional' was "well known, and with books to your name." Well, I have to accept that I will never be the kind of designer who runs workshops at knitting shows - because I can't travel to them. But I have been thinking about a printed collection of patterns. Back in the days when I wrote fiction and poetry, I knew exactly how to approach a publisher (synopsis, sample chapter, all double-spaced, and neatly printed on A4) - but I'm not altogether sure of the etiquette to be followed when submitting an idea for a knitting book. Obviously most of it will be the same - but instead of a sample chapter, do I send a sample hat? Anyway, it's something I'm looking into, and I will report back on my progress. This seems very unfair to me. I understand that the important part of being a designer is having the ideas in the first place, but surely the best ideas come from understanding the way items are created and put together in the actual materials you are going to use? I don't think it's right that someone who has done so much work on an item isn't given any credit. Similarly, I think it's disgraceful that individual designers and/or knitters are not credited in the individual patterns that yarn companies sell. I can understand why designers, however good a knitter they may be, use other people to knit their designs up and it's something I may have to start considering for myself. You see, when you are a designer, everybody always asks you where you get your ideas from. Nobody ever asks you how many of the damn things attack you at once. I don't know what it's like for other designers but, as soon as I pick up my needles, my brain is off thinking up all kinds of other useful and inventive ways to use the yarns that are sitting around my room. Even if I were in the best of health, I would never be able to knit up all of my designs, so I'm starting to see an additional appeal in working with magazines like Vogue Knitting and Interweave Knits, where you supply the pattern and it is knitted up for you. I can't see how I will ever put all of my ideas into practice without farming them out to other knitters - especially if I am going to produce a collection in book form. Don't get me wrong - I'm not giving up knitting altogether; I love knitting up my own designs. In fact, quite often, the designs evolve as I'm creating them. But I think that I have enough work with British knitting magazines and private commissions to keep my needles clicking for a good while yet. It's just that I know, if I want to see more than a quarter of my designs knitted up, that I have to admit that I need other people to help me do so. Anyway, those are my thoughts at the moment. I haven't even got so far as considering how I will choose my knitters, or how much they will be paid. But you can be sure of one thing: they will be given credit for doing the work! 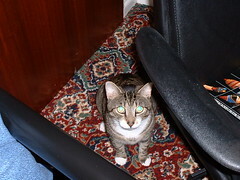 Tigger says, "You will still have time to cuddle me, Mum, won't you?" Hello Heather, great new blog! The double glazing men have gone and we are delighted with the new windows. We set the computer up in the chaos of piled up furniture and books and it is great to be back online again. it's so good to see you back. To me, you are a professional designer. I think it's wrong when a pattern in a knitting magazine or book does not credit the designer. It's the first thing I look for - the name of who created the piece. Good luck with your plans. Who is setting the rules? To some people I'm a designer, and I am not selling my patterns or knitted works... Creativity should be the mark, not fame. And yes, credit needs to be given where credit is due. A nice blog! A nice cat!